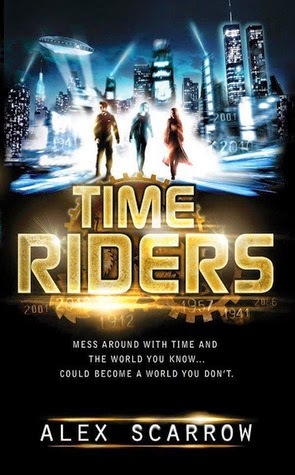 Maddy, Sal, and Liam are recruited by Foster to become the newest TimeRiders, since the old team was killed by seekers. A guy called Kramer goes back in time to help Hitler win the war, and so Liam and an AI called Bob (best name ever, by the way) follow him to 1956 to learn how to fix things. New York in 2001 becomes a wasteland, and there are creepy cannibals all over the place. Liam and Bob finally return just when things start to get bad in 2001, before going back to 1941 to kill Kramer and prevent all of this from happening. In the end, everything gets sorted, no good guys die, and Foster leaves the teenagers to fend – and TimeRide – for themselves. Liam O’Connor is rescued from drowning on the Titanic in 1912. Maddy is saved from being blown up on a plane in 2010. Sal is rescued from a fire in 2066. Foster brings them together and tells them he’s going to turn them into TimeRiders. First of all, they practice with JFK’s assassination. Liam and Foster go back in time together, and stop Oswald from shooting JFK. This changes history slightly for Maddy and Sal, who are back in New York in September 2001. They have to figure out where Liam and Foster went back to. They do, and then the second shooter on the grassy knoll kills JFK, which corrects history. Bob is born. He’s an artificially grown AI who will accompany Liam on his missions back in time. Cut to Kramer, who takes Waldstein’s time machine (which he believes is the only one) and goes back to 1941, to Nazi Germany. He meets Hitler and tells him not to invade Russia, thus helping him to win the war. Sal notices that something is up in New York, since everyone is walking around in grey and everything is a lot quieter. She returns to HQ to tell Foster, Maddy, and Liam. Liam and Bob go back in time to 1956, to the day that the USA is conquered. They didn’t go back further because they had no idea when exactly everything changed. This is an intelligence mission right now. The White House is conquered, and the President is killed. Bob pretends to be a solider, and Liam is taken to a camp. Kramer finds the remains of a time traveller, similar to what he saw before in 1941 after he travelled back there from the future. He starts to become paranoid that people are following him from the future. Back in 2001, Sal realises that New York has now become a wasteland. There are weird humans with bleeding noses and they’re really vile. Foster and Maddy save her and they realise that these weird humans are cannibals. They are the result of some sort of nuclear war. Bob spends six months looking for Liam. Along the way, he accidentally recruits a bunch of followers who think he’s some sort of guardian angel. HQ in 2001 loses power, and Foster and co. have to go to find diesel for the generator. They get some, which is good because they need it to get Liam and Bob home safely. Maddy discovers that Foster is really 27. He just looks hella old because of all the time travelling he’s been doing. Maddy gets angry because Foster didn’t tell Liam what time travel would do to his body before he went back in time. Bob finds Liam. Finally. Bob’s followers are jealous because their leader is best friends with Liam, but whatever. Eventually they have to leave the followers behind, because they need to get home to 2001. Meanwhile, Kramer’s mental health is deteriorating. He’s still convinced that time travellers are after him. Foster and Maddy and Sal get the generator working for a bit, enough to send a small signal back to 1956. Bob and Liam now know to go back towards the White House. Unfortunately, when it opens the portal is way too small for Liam to fit through. Bob tells Liam to hack into his head and send the information forward in time. Liam won’t do it because Bob is his buddy. Everyone’s upset because Liam and Bob didn’t go back. But Liam gets an idea: He and Bob have to travel to New York and write leave a message for Maddy, Foster, and Sal at the museum that they had visited when Foster was introducing them to the whole TimeRiders thing. Liam leaves a message telling Maddy and Foster and Sal where they are going to be, and at what time, so they can send a precise portal back for them. On the way back to HQ, the cannibals attack, and Sal gets taken. Maddy and Foster make it back, and start to fire up the generator when the cannibals start to break in. Luckily, Bob and Liam return just in time to save the day. Kramer finally loses it. He gets his men to kill his best buddy, Karl, and he sets off the nuclear bomb which wipes out the entire world and causes the apocalyptic wasteland that the gang are currently living in in 2001. Bob and Liam tell Foster what they learnt. They need to go back in time to 1941 to kill Kramer and his crew before they meet with Hitler and help him win the war. Liam and Bob save the day by killing Kramer and his men, thus correcting history and setting everything right. It’s kind of upsetting because Kramer initially went back in time to protect the Earth and prevent it from becoming overcrowded and polluted, and he doesn’t believe that his future self would set off a bomb like that. Alas, he is killed, and the day is saved. Unfortunately, Bob “dies”, and Liam has to take his brain back with him to 2001. They put Bob’s brain onto the computer, so now he’s an AI within a computer instead of in a kind of human body. Sal returns, knowing very little of what went on.